Bio Girl: Dove Conditioner: A BlogHer and Dove Review and $1000 Spa Give Away! Dove Conditioner: A BlogHer and Dove Review and $1000 Spa Give Away! Two posts in one day? I KNOW! Things are crazy around here. But I am once again pairing with BlogHer and Dove to review a product and bring you a chance to win a $1000 Spa Gift card! How cool is that? This is a paid review, so if you are are not into that sort of thing, no big deal. Click away and come back tomorrow when I will be back to my normal randomness that unfortunately does not include $1000 spa give aways. My hair is a natural disaster. I have that kinda wavy, huge hair that just takes over. It isn't curly, and it most definitely isn't straight. When it's humid outside it expands at an exponential rate. I have the very best 80's hair around. Although as a child in the 80's I felt I needed to perm this monstrosity to fit in, so I guess we are never happy with what we have. Anyway, my hair, it's out of control. But in order to attempt to keep it under control I constantly apply product and heat. If I wear it "curly" I douse it with a spray hair gel, and if I wear it straight i blow dry it, then flatten it with a straight iron. My poor hair... I really abuse it now that I think about it. 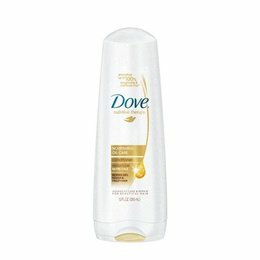 So, when BlogHer and Dove contacted me to review their new Nourishing Oil Care Conditioner I was all in. Especially when they told me that it's main purpose is to smooth dry, rough and frizzy hair. Because... yes. That is the definition of my hair. They just need to add "out of control" and the will have summed it up perfectly. When the bottle arrives in the mail I was immediately on board with this stuff because it smelled awesome. My mom was standing there and I waved it under her nose as well, and she said "Oh... I would use THAT!" But it's conditioner... you can't go on smell alone. So I started using it, and have now been putting it on my hair for the last couple of weeks. It's pretty much everything you want a conditioner to be. It isn't greasy and it doesn't weight my hair down, but it definitely is helping to control the frizz and seems to have my hair looking healthier, which is a real feat with all the damage I have inflicted. It is a good price for a great conditioner. I will buy it instead of the more expensive one I was using before this review, simply because I think it works better. What is is your favorite thing about your hair? See how I went with a positive question there? I was going to ask what annoys you most about your hair, but then though "wait.... let's make people feel good about themselves." So...You. Are. Welcome.